Home > Used Vehicles > 2014 Audi Q5 3.0T quattro Technik,SQ5,AWD,LEATHER,SUNROOF,NAVIGATION,BLUETOOTH,BACK UP CAMERA, 356 HP,MUST SEE!!!! 2014 Audi Q5 3.0T quattro Technik,SQ5,AWD,LEATHER,SUNROOF,NAVIGATION,BLUETOOTH,BACK UP CAMERA, 356 HP,MUST SEE!!!! Cylinders: 3.0L V6 24V GDI DOHC Supercharged - 6 cyl. On Sale! Save $4950 on this one, we've marked it down from $39900. This 2014 Audi Q5 is for sale today in Edmonton. 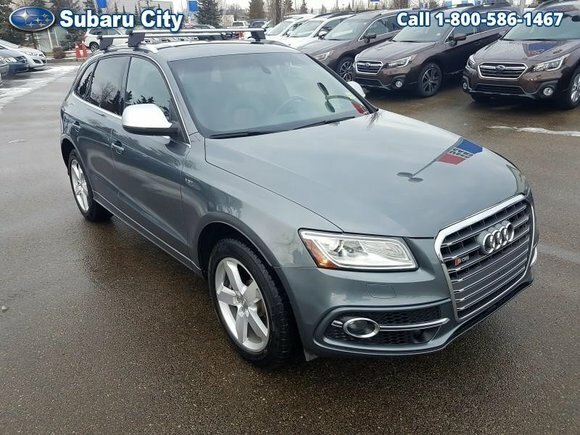 There’s something special that sets this Audi Q5 that sets it apart from the dozens of luxury crossovers available. Maybe it’s the contemporary, yet timeless exterior styling. Maybe it’s the unique balance of fun, sporty performance with the versatility of expanded interior volume. It might be the exhilaration of the steering wheel in your hands or the thrills it commands while you take in the winding road ahead. No matter your reasons, you have the capability to leave tracks where your journey takes you - in the one vehicle that is ready to leave its impression on you. This SUV has 88050 kms. It's daytona grey pearl effect in colour and is completely accident free based on the CARFAX Report. It has an automatic transmission and is powered by a 3.0L V6 24V GDI DOHC Supercharged engine. Buy this vehicle now for the lowest bi-weekly payment of $257.98 with $3753 down for 72 months @ 5.99% APR O.A.C. ( taxes included, $790 Administration and Secure Ride included / Total cost of borrowing $6470 ). See dealer for details. Want to try the 2014 Audi Q5 3.0T quattro Technik?